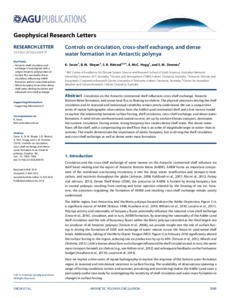 Circulation on the Antarctic continental shelf influences cross-shelf exchange, Antarctic Bottom Water formation, and ocean heat flux to floating ice shelves. The physical processes driving the shelf circulation and its seasonal and interannual variability remain poorly understood. We use a unique time series of repeat hydrographic observations from the Adélie Land continental shelf and a box inverse model to explore the relationship between surface forcing, shelf circulation, cross-shelf exchange, and dense water formation. A wind-driven northwestward coastal current, set up by onshore Ekman transport, dominates the summer circulation. During winter, strong buoyancy loss creates dense shelf water. This dense water flows off the shelf, with a compensating on-shelf flow that is an order of magnitude larger in winter than in summer. The results demonstrate the importance of winter buoyancy loss in driving the shelf circulation and cross-shelf exchange, as well as dense water mass formation.